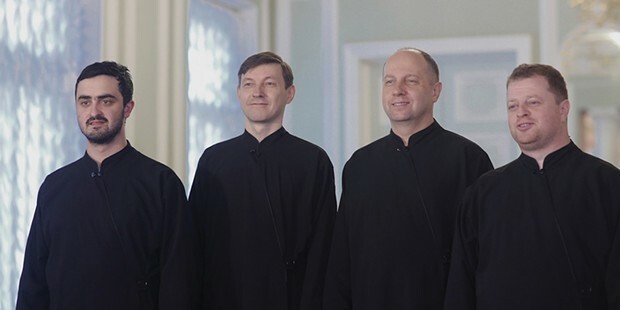 Konevets Quartet sings devotional music and Slavic folk tunes at St. Innocent Orthodox Church on Thursday, Feb. 14 at 7 p.m. I am tired and the delightful Les McCann reissue from 1966 I am listening to nonstop is putting me down at the coda of a long working day. So instead of blathering, I will share a quick thought with you: As much as I like this record, I'm glad people don't just casually write break-up tunes called She Broke My Heart (And I Broke Her Jaw) anymore. That kind of violence makes the mob-land massacre and martyred saints of Feb. 14 seem like preferable romantic associations. Be good to each other, whether in love or out of it. It's the loaded love holiday so, in deference to all our different relationships to this day, I will cast a wide net for your entertainment options. If your yearning isn't for eros but comes in the spiritual form, then I suggest you check out the concert at St. Innocent Orthodox Church by the St. Petersburg, Russia-based Konevets Quartet, founded at the Konevets Monastery as a male vocal ensemble to sing Russian Liturgical music. 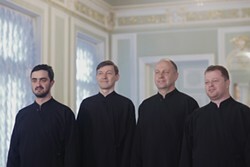 Tonight's 7 p.m. performance includes both devotional music and Slavic folk tunes sung in harmony. The concert is free with the fellows taking a collection. RSVP with the church at 443-2099, as space is limited. If your heart is broken and you wish to share this fact with other lovelorn folks, come over to the Miniplex at 9 p.m. for a special edition of Love Bites Sad Karaoke. For a two-drink minimum you can perform bitter classics like "Girlfriend in a Coma," literally any Supremes song except "I hear a Symphony" or even just fully embrace the black with the "Theme from M.A.S.H." Finally, if you want to dance, dance and make romance, at 10 p.m. Humbrews has Jamaican rhythm-section legends Sly and Robbie and the Taxi Gang to get your blood flowing to all the right places. Also on board is British lovers rock legend Bitty Mclean, as well as opening ceremonies provided by DJ Ras Azad ($25, $22 advance). There are two fun, free shows going on tonight at 9 p.m. in geographically dichotomous regions. Portland's danceable backyard cowboy swing act Jenny Don't and the Spurs returns to the Logger Bar for an evening of energetic tunes. 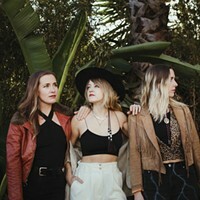 Joining in will be local cosmically-minded coo-coo country act Moon Pine. Meanwhile, back in Arcata, there will be a local music showcase for upstart bands. Trio Mrdr MTN (sound it out with imported vowels) plays its first show, so you can see what is meant when the flier says it's a "stoner swamp punk band." Also on the bill are Over Yonder and Dune Bums, which is described as "long-haired Latinx garage punk." Cool. RampArt is putting on another massive punk show tonight at 8 p.m. Headlining will be the anarcho-crust ska band Leftöver Crack, whose name is noted for gracing more fliers, T-shirts and venue-bathroom applied stickers than almost anyone else in the world of underground music in the last 20 years. 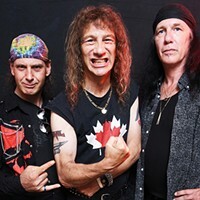 Fellow New Yorkers Cop/Out and Houston's Days N Daze are on the underbill as well, but I'd really be burying the lede if I didn't point out that four-decades old Canadian rough joke act Dayglo Abortions will be bringing its uniquely asocial punk rock to the halfpipe stage tonight. This will be one for the books. What books those are remains to be seen ($20). Later on at the Alibi, there's a benefit show for Hollow Down, whose tour bus/home went up in flames last month (as I mentioned in a recent column). The folks Strix Vega and Mojave Green have generously donated their time tonight at help the boys raise some coin for a new set of wheels. The music starts at 11 p.m., the show is only $5 and it's all for a good cause. Cuco is the stage name of Los Angeles teenage pop prodigy Omar Banos. He returns to Humboldt with his lo-fi, lovesick grooves to play the Kate Buchanan Room at 8 p.m. ($25). This one's mostly geared for fellow kids, but if you are of a different age and still an appreciator of idiosyncratically-produced songs about heartbreak and love I am sure that there is space here for you, too. Seattle's Scott Yoder is a self-described "glitter-elf folk prince" who traffics in a kind of glammy pop that draws a lot of water from the same stream as T Rex, David Bowie and contemporary Ariel Pink. He plays the Siren's Song tonight where he will be joined by Los Angeles sparkly goth rock act Old Gold as well as local dusty vespertine drifter Opossum Sun Trail. Sounds like a good night for a break from the cold mid-February slumberland of Eureka. The Phat Tuesday series at Phatsy Kline's Parlor Lounge continues this week with local singer, guitarist and raconteuse Anna Hamilton at 7 p.m. Come see why she is a featured and appreciated act in the local tavern scene (price TBA). There's metal afoot at the Siren's Song. Auburn-area doom and drone band CHRCH makes a tour-stop tonight where they will be joined by Un, a Seattle band cut from the same black cloth. At 7:30 p.m. ($8). Local support comes from instrumental powerhouse Ultramafic and motor-psychos Dullahan. Collin Yeo wishes that you all experience the "love you take/love you make" dynamic outlined by Paul McCartney in "The End." He lives in Arcata.